Aim: Although drug-drug interactions (DDIs) cause major adverse drug reactions (ADRs) in patients under polypharmacy, the risk of some specific DDIs may be overrated in literature and different software. This study was conducted to determine the frequency and type of potential and clinically significant DDIs among inpatients admitted in a tertiary care hospital in South India. Materials and Methods: This longitudinal study was conducted for 30 days. Preformatted forms were used to collect data on the second day of admission. 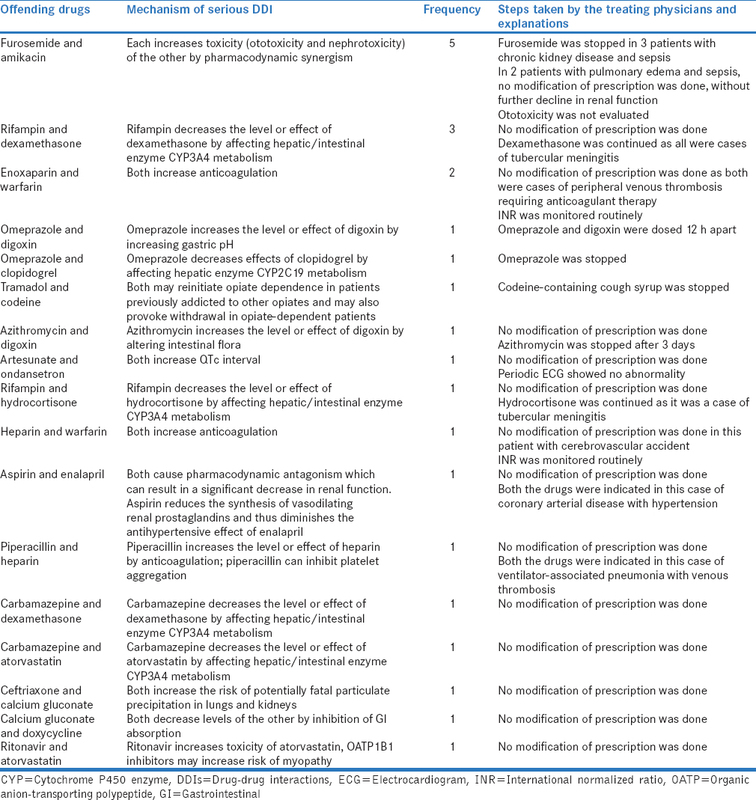 “Medscape Drug Interaction Checker” was used to evaluate and grade the DDIs. All the potential serious DDIs were intimated to the treating physicians and their responses in the prescriptions were noted. The same patients were followed up to evaluate the occurrence of any clinically significant DDIs. Results: A total of 763 drugs with 125 discrete types were prescribed in 155 patients with an average of 4.9 drugs per patient. One hundred and eight minor, 169 significant, and 24 serious potential DDIs were identified. Patient's age did not correlate, but number of drugs prescribed strongly correlated (P < 0.001) with the incidence of different types of DDIs. The prescription was modified in only 6 (25%) cases where potential serious DDIs were reported. Interestingly, no ADRs or impaired efficacy was observed due to the potential serious DDIs. Conclusion: There was a disparity between the potential and clinically relevant DDIs. Hence, clinical prudency is required before changing prescription due to potential DDIs reported by different software. Drug-drug interactions (DDIs) are defined as “two or more drugs interacting in such a manner that the effectiveness or toxicity of one or more drugs is altered.”, DDIs contribute to a major part of adverse drug reactions (ADRs), especially in elderly patients and in patients under polypharmacy. ADRs are a major cause of hospital admissions leading to significant medical and economic problems. In general, the prevalence of clinically relevant drug interactions is about 6% in patients taking 2–4 medications, 50% in those taking 5, and almost 100% in those taking 10 medications. Approximately 37%–60% of patients admitted to the hospital may have one or more potentially interacting drug combinations at admission. The proportion of hospital admissions due to DDIs can range up to 3.8%., In inpatients, the risk of having potentially interacting drug combinations can additionally increase because new drugs are often added to the existing drug therapy. Recent studies could show that 2.2%–65.0% of inpatients may have one or more potential DDIs. Another review estimates that 17% of all preventable ADRs in hospitalized patients are caused by DDIs and that ~1% of patients experience an ADR during hospitalization due to a DDI. Various studies in India have also shown significant DDIs resulting in increased morbidity among patients admitted in various tertiary care hospitals. Interestingly, around half of the ADRs resulting from DDIs are predictable and preventable. However, the incidence of actual occurrence of drug interactions has been reported to be much smaller, ranging from 0% to 1.3%., It is also to be borne in mind that many of the “theoretical” or potential DDIs might not be important “clinically” for a change in treatment decision in the real world setting. The risk of some specific DDIs may be overrated in literature and different software as well. Thus, it is required to estimate the potential as well as clinically significant DDIs among the inpatients on polypharmacy. With this background, this study was conducted to determine the frequency and type of potential and clinically significant DDIs among inpatients admitted in a tertiary care hospital in South India. This study was conducted as per “National Ethical Guidelines for Biomedical and Health Research Involving Human Participants,” Indian Council of Medical Research. Approval of the Institutional Ethics Committee, Jawaharlal Institute of Postgraduate Medical Education and Research (JIPMER), Puducherry, was obtained for the same. This was a observational and longitudinal study. The duration of this study was 30 days. Preformatted forms were used to collect data from the case sheets of all the inpatients admitted in the general ward under the Department of Medicine (Unit 2), JIPMER, Puducherry (a tertiary care hospital), during the study period. Demographic information, working/established diagnosis, and medication details were collected on the second day of admission in the general ward. “Medscape Drug Interaction Checker” was used to evaluate and grade the DDIs. It grades DDIs into three categories: minor (no change required), significant (monitor closely), and serious (use alternative). All the potential serious DDIs were intimated to the treating physicians and their responses in the prescriptions (continue/discontinue/adjust dose/adjust frequency/substitute the particular drug[s]) were noted subsequently. The physician's decisions were not influenced. The same patients were followed up till discharge to evaluate the occurrence of any clinically significant DDIs, i.e., ADRs or impaired efficacy or abnormal concentration of drug(s) in the body fluid resulting from the reported potential serious DDIs. The prevalence of polypharmacy was assumed to be 50%. The hypothesized percentage frequency of outcome factor in the population studied (P) is 50%. The confidence limit (L) is taken as 5%. Using the formula, n = (Z1-α/2)2 × PQ/L2 (where Q = 100- P and Z1-α/2 value for 95% confidence interval = 1.96), the required sample size (n) came to 96. Descriptive statistics were used for demographic characteristics and types of potential and clinically significant DDIs. Pearson correlation was determined between the incidence of different types of DDIs with age and number of drugs prescribed. P < 0.05 was considered as statistically significant. All analyses were done in SPSS (version 19) (IBM, New York, NY, USA). A total of 155 patients' case sheets were studied. The mean age of the patients was 44 ± 17 years with 51.3% being males. A total of 763 drugs with 125 discrete types were prescribed in all the patients with an average of 4.9 drugs per patient. 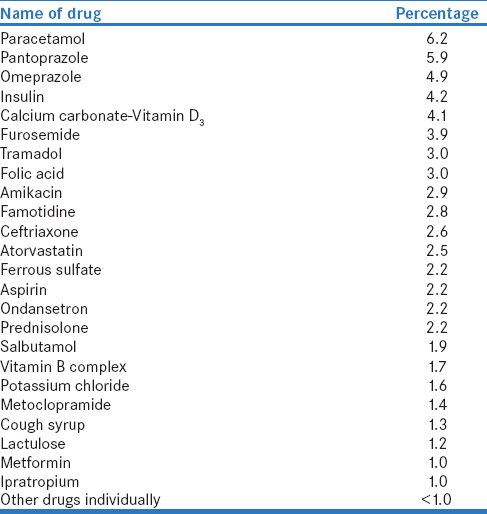 The most commonly used drugs are enlisted in [Table 1]. Of all these drugs, 65% were administered orally, 22.5% intravenously, 5.1% subcutaneously, 3.3% were administered through inhalational route, and 1.4% through intramuscular route. Using the “Medscape Drug Interaction Checker,” 108 minor, 169 significant, and 24 serious potential DDIs were identified. There were no potential DDIs in 75 (48.4%) patients. Patient's age did not correlate, but number of drugs prescribed strongly correlated (P < 0.001) with the incidence of different types of DDIs [Table 2]. All the 24 serious potential DDIs were intimated to the treating physicians. Prescription was modified in only 6 (25%) cases. [Table 3] shows the details of the serious DDIs with steps taken by the treating physicians after reporting. Drug concentration in the body fluid was not measured for any of these patients. Interestingly, no ADRs or impaired efficacy was observed due to the identified potential serious DDIs. In this study, we wanted to evaluate the frequency and type of potential and clinically significant DDIs among inpatients. Polypharmacy is unavoidable as elderly patients usually suffer from many chronic diseases which demand the use of multiple drugs resulting in complex regimen. In these patients, the chances of DDIs increase proportionally. However, studies assessing potential DDIs should be separated from those looking at clinically significant DDIs. In our study, we have found more potential DDIs (51.6%) when compared to other studies, such as, that of Björkman et al. (46%) and Gosney and Tallis (33%). Polypharmacy was also higher (84.5%) in our study than that reported internationally., Since there was a strong correlation with frequency of different DDIs and number of drugs prescribed, higher polypharmacy might have attributed to higher DDIs in our study. Apart from polypharmacy, other drug factors contributing to higher rate of DDI are drugs with narrow therapeutic index and sequence of drug administration. Patient-related factors leading to higher DDI include age, gender, genetics, comorbid condition, concurrent disease affecting drug clearance, and the number of physicians a patient visit. In our study, we have found that most of the potential DDIs were significant, followed by minor and serious. Although all the potential serious DDIs were intimated to the treating physicians, prescriptions were changed only in 25% of the cases, with clinical justification. However, no ADRs or impaired efficacy was observed due to the potential serious DDIs. Thus, there was a disparity between the potential and clinically relevant DDIs. Previous authors have also expressed their concern on the usefulness of electronic software in predicting clinically relevant DDIs as these software tend to overalert. Kulkarni et al. reported that checks by a pharmacologist agreed with only 11% of DDI alerts from electronic software, and the remaining 89% were thought to be of not clinically relevant. It is thus important to monitor and evaluate the clinically significant DDIs and distinguish them from the “theoretical” or potential ones in each setting. Physicians remember common and clinically significant DDIs and it is impracticable for them to remember all the potential DDIs as available from literature or drug interaction software. It might not be also possible in real practice to change prescription for each and every potential DDIs. The potential benefits of drug combinations should be weighed against the seriousness of the DDI, taking into account of the availability of alternatives. If the benefit of treatment is of such importance that it outweighs the potential risks and no safer alternatives are apparent, then the risks of a potential DDI may be tolerated and treatment can be continued with appropriate monitoring. Our study was conducted for a short duration with a small number of patients in a selected ward and unit, which might not reflect the actual scenario in the entire hospital. It is also noteworthy to mention here that several studies testing the performance of drug interaction software found low levels of sensitivity and specificity, but more recent studies indicate that sensitivity and specificity have improved. Using “Medscape Drug Interaction Checker” should be coupled with considering the real clinical scenarios (where some DDIs might be therapeutically warranted) on a case-to-case basis to arrive at a clinical decision. Twenty-four serious potential DDIs were identified among 155 patients. Prescription was modified in only 6 (25%) of these cases. No ADRs or impaired efficacy was observed due to the identified potential serious DDIs. Thus, there is a disparity between the potential and clinically relevant DDIs. Clinical prudency is required before changing prescription due to potential DDI reported by different software. Peterson JF, Bates DW. Preventable medication errors: Identifying and eliminating serious drug interactions. J Am Pharm Assoc (Wash) 2001;41:159-60. Ray WA, Murray KT, Meredith S, Narasimhulu SS, Hall K, Stein CM, et al. Oral erythromycin and the risk of sudden death from cardiac causes. N Engl J Med 2004;351:1089-96. Köhler GI, Bode-Böger SM, Busse R, Hoopmann M, Welte T, Böger RH, et al. Drug-drug interactions in medical patients: Effects of in-hospital treatment and relation to multiple drug use. Int J Clin Pharmacol Ther 2000;38:504-13. Patel PS, Rana DA, Suthar JV, Malhotra SD, Patel VJ. A study of potential adverse drug-drug interactions among prescribed drugs in medicine outpatient department of a tertiary care teaching hospital. J Basic Clin Pharm 2014;5:44-8. Leape LL, Brennan TA, Laird N, Lawthers AG, Localio AR, Barnes BA, et al. The nature of adverse events in hospitalized patients. Results of the Harvard Medical Practice Study II. N Engl J Med 1991;324:377-84. Helms R, Quan D, Herfindal E. Textbook of Therapeutics: Drug and Disease Management. 8th ed. Philadelphia, Pa: Lippincott Williams and Wilkins; 2006. Gosney M, Tallis R. Prescription of contraindicated and interacting drugs in elderly patients admitted to hospital. Lancet 1984;2:564-7. Raschetti R, Morgutti M, Menniti-Ippolito F, Belisari A, Rossignoli A, Longhini P, et al. Suspected adverse drug events requiring emergency department visits or hospital admissions. Eur J Clin Pharmacol 1999;54:959-63. Jankel CA, Fitterman LK. Epidemiology of drug-drug interactions as a cause of hospital admissions. Drug Saf 1993;9:51-9. Herr RD, Caravati EM, Tyler LS, Iorg E, Linscott MS. Prospective evaluation of adverse drug interactions in the emergency department. Ann Emerg Med 1992;21:1331-6. Krähenbühl-Melcher A, Schlienger R, Lampert M, Haschke M, Drewe J, Krähenbühl S, et al. Drug-related problems in hospitals: A review of the recent literature. Drug Saf 2007;30:379-407. Mateti U, Rajakannan T, Nekkanti H, Rajesh V, Mallaysamy S, Ramachandran P, et al. Drug-drug interactions in hospitalized cardiac patients. J Young Pharm 2011;3:329-33. Bertsche T, Pfaff J, Schiller P, Kaltschmidt J, Pruszydlo MG, Stremmel W, et al. Prevention of adverse drug reactions in intensive care patients by personal intervention based on an electronic clinical decision support system. Intensive Care Med 2010;36:665-72. Ho YF, Huang SH, Lin HN. Detecting drug-drug interactions in medication profiles of psychiatric inpatients: A two-stage approach. J Formos Med Assoc 2002;101:294-7. Kurfees JF, Dotson RL. Drug interactions in the elderly. J Fam Pract 1987;25:477-88. Yu DT, Peterson JF, Seger DL, Gerth WC, Bates DW. Frequency of potential azole drug-drug interactions and consequences of potential fluconazole drug interactions. Pharmacoepidemiol Drug Saf 2005;14:755-67. Available from: http://www.icmr.nic.in/guidelines/ICMR_Ethical_Guidelines_2017.pdf. [Last accessed on 2017 Nov 20]. Multi-Drug Interaction Checker. Available from: https://www.reference.medscape.com/drug-interactionchecker. [Last accessed on 2017 Oct 26]. Salwe KJ, Kalyansundaram D, Bahurupi Y. A study on polypharmacy and potential drug-drug interactions among elderly patients admitted in department of medicine of a tertiary care hospital in Puducherry. J Clin Diagn Res 2016;10:FC06-10. Mallet L, Spinewine A, Huang A. The challenge of managing drug interactions in elderly people. Lancet 2007;370:185-91. Björkman IK, Fastbom J, Schmidt IK, Bernsten CB; Pharmaceutical Care of the Elderly in Europe Research (PEER) Group. Drug-drug interactions in the elderly. Ann Pharmacother 2002;36:1675-81. Hajjar ER, Cafiero AC, Hanlon JT. Polypharmacy in elderly patients. Am J Geriatr Pharmacother 2007;5:345-51. Abrams WB, Beers MH. Clinical pharmacology in an aging population. Clin Pharmacol Ther 1998;63:281-4. Taegtmeyer AB, Kullak-Ublick GA, Widmer N, Falk V, Jetter A. Clinical usefulness of electronic drug-drug interaction checking in the care of cardiovascular surgery inpatients. Cardiology 2012;123:219-22. Kulkarni V, Bora SS, Sirisha S, Saji M, Sundaran S. A study on drug-drug interactions through prescription analysis in a South Indian teaching hospital. Ther Adv Drug Saf 2013;4:141-6. Becker ML, Caspers PW, Kallewaard M, Bruinink RJ, Kylstra NB, Heisterkamp S, et al. Determinants of potential drug-drug interaction associated dispensing in community pharmacies in the Netherlands. Pharm World Sci 2007;29:51-7. Abarca J, Colon LR, Wang VS, Malone DC, Murphy JE, Armstrong EP, et al. Evaluation of the performance of drug-drug interaction screening software in community and hospital pharmacies. J Manag Care Pharm 2006;12:383-9.